If you’re trying to keep your carbs low and your waist tiny, you have probably sworn off pizza. However, I have got a solution for you! 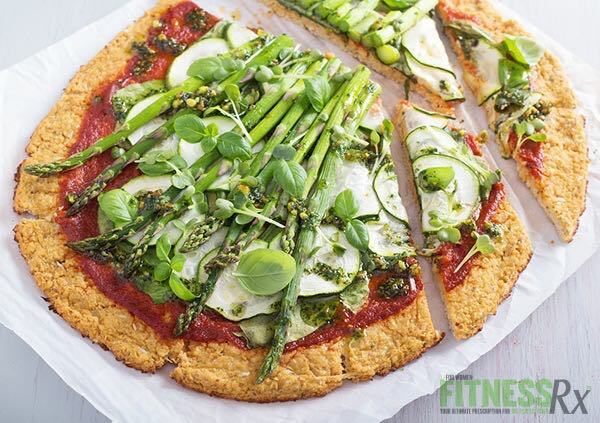 Not only is my Cauliflower Crust Pizza low in carbs, it’s actually delicious and healthy, too! By substituting cauliflower for flour, the calories and carbohydrates are reduced considerably. It works because the cauliflower combines with the egg and cheese to form a sticky dough, which becomes the crust. Give it a try and see for yourself! Enjoy! *your favorite veggies, such as asparagus, thinly sliced zucchini, onions, etc. 1. Preheat oven to 450 degrees F. Place a baking sheet in the oven and allow it to heat up. 2. Place a large piece of parchment paper onto a flat surface and spray it with nonstick cooking spray. 3. Cut off the florets from the head of cauliflower and wash and thoroughly dry. Put in food processor and pulse until powdery consistency is reached. You should get about 2.5 cups. Place in a microwave-safe bowl, cover and microwave for 5 minutes. Dump cooked cauliflower onto a clean towel to further dry and allow to completely cool. Wrap it up in the towel and wring it out as much water as possible (this is what gives you a chewy versus crumbly crust). 4. Put cauliflower into a mixing bowl and add salt, pepper, spices, parmesan, mozzarella cheese, egg, and egg white. Mix well (I recommend using your hands) until thoroughly mixed and a nice sticky dough is formed. 5. Now, use your hands to form the dough into a circular crust form on your oiled parchment paper. Pat it down and ensure that there are no holes. Carefully slide the parchment paper onto your hot baking sheet in the oven. Bake for about 15-20 minutes, until it starts to turn golden brown (keep an eye on this so it doesn’t burn, but you will want it to be well done). Remove from oven. 6. Add the sauce and your favorite toppings and then put back into the oven and bake for an additional 8-10 minutes (again, watching closely to avoid burning)! Remove from the oven and allow pizza to cool for a few minutes before slicing and serving. Enjoy!